In a stunning near-unanimous voice, the BBWAA actually looked past win totals in order to award the AL Cy Young to the rightful winner, Zack Greinke. The 26-year-old ace, who briefly left the Kansas City Royals several years ago after battling Social Anxiety Disorder was absolutely the best pitcher in the AL, if not all of baseball this year, and it would have been an absolute TRAVESTY had he not won it because of his low win totals. Put Greinke on the Yankees (please don’t EVER EVER EVER allow this to happen) and he’d likely have won 22-24 games, it wasn’t his fault that the anemic Royals offense scored 2 runs or less in 12 of his 33 starts. Normally a player would be overwhelmed with excitement at winning his first (of several to come) Cy Young awards, but Greinke, who much prefers not to be in the spotlight is a bit more understated. This is quite the week for Greinke, first he wins the Cy Young and on Saturday he is getting married to his high school girlfriend, Emily Kuchar, who was once a Dallas Cowboy’s Cheerleader. Lucky man. 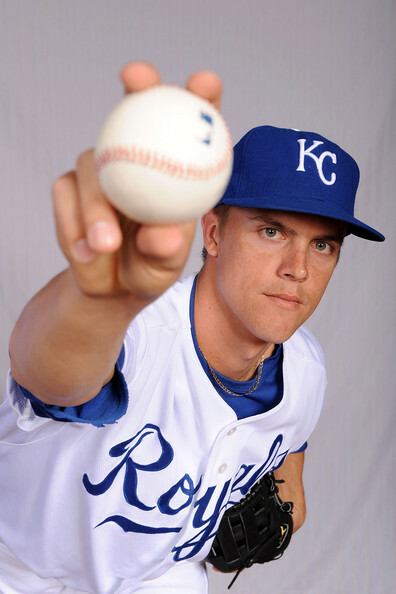 Toss in the 4-year $38 million contract extension he signed in January and everything seems to be coming up Greinke. I swear we’re smart in Boston. Really! New England has a proud tradition of education, Harvard University is there, have you heard of it? 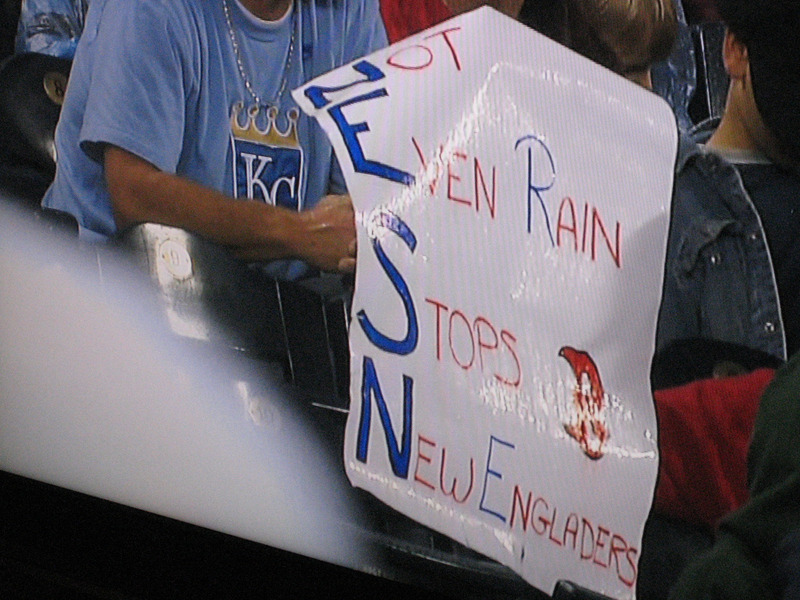 Methinks though this sign-maker who was at the Red Sox/Royals game last night is NOT an alum. Disco Hayes Coming to a Big League Park Near You? 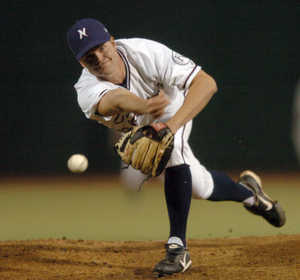 Undrafted out of Northwestern, Chris Hayes paid his own way to Arizona for the possibility of some open tryouts with a few MLB teams and living his dream of playing in the big leagues. Someone mentioned to him that the Royals were also having a try-out. “What’s the surprise?” Hayes asked. “The town,” the guy said. “The tryout is going to be in a surprise town?” Hayes asked. Amazingly, he went to the try-out and the Royals offered him a minor-league contract. 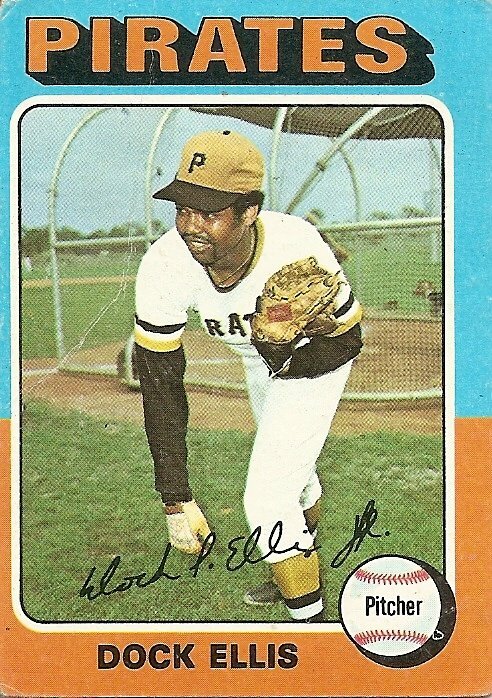 Hayes, nicknamed “Disco” because his sidearm-flung fastballs all are in the 70s, doesn’t light up the radar gun, obviously, and had never in his life ever made an all-star team, at any level of baseball. Yesterday the Kansas City Royals released portly right-hander Sidney Ponson. Considering he has a 1-7 record in nine starts with a 7.36 ERA and an ERA+ of 59, this shouldn’t be a big surprise. Even for a team as miserable as the Royals, those numbers are simply too awful to ignore. Yeah, location is kind of like SUPER important if you’re a pitcher. Call me crazy, but if you can’t throw strikes by the batter you’re not going to have any success, something Ponson hasn’t seen since approximately 2003. Yesterday the Kansas City Royals and their new food provider — and minority Red Sox owners — Aramark held a press conference to show off some of the new food options available this season at Kauffman Stadium. 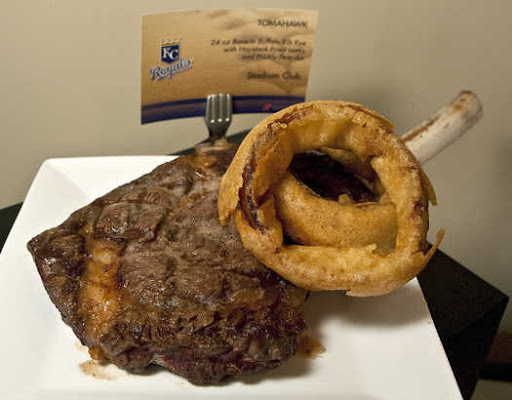 The new fare looks delicious, none more so than this 24 ounce bone-in buffalo rib-eye with onion rings. Yum! The rest of the new options all look delicious too, and with many analysts projecting a leap forward for the Royals, who knows, maybe the awesome food dishes will match up with the play on the field. In the meantime, I like my buffalo steak medium rare. Willie Bloomquist is a super-scrubby utility man who can field a little bit and run fast, but has some issues with that old “hitting the baseball” skill that most professional baseball players need. So, of course he gets a 2-year $3.1 million contract over the off-season from the Kansas City Royals to leave the Seattle Mariners. When he entered the clubhouse the first time he might have gotten very confused to see that he was already there. That would have been Royals catcher John Buck, best remembered by me as the guy who took Hideki Okajima deep on the first pitch Oki threw in the majors. I can only hope they utilize both men’s physical similarities for some incredibly awesome trick play. And of course, please vote in the poll below in order to send these doppelgangers on to their final resting place, and make sure to check out all the other doppelgangers we’ve assembled by clicking here.